The website will automatically provide you with local classifieds that fit your location. However, if this is inaccurate, you can simply find your desired location in the column on the right side of the screen. You can also click on the city name in the top bar and type in the city you are seeking. Once you have chosen your desired location, choose the Post to Classifieds option in the top left corner. 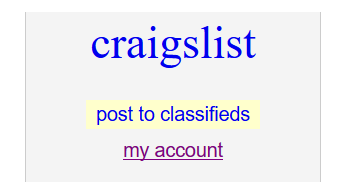 You can also choose to sign into your account if you have an existing Craigslist profile or you can post your ad anonymously. Don’t have an account yet? Check here to find out how to create a Craigslist profile. From here, you will see a page which asks you to choose a category for your post. Choosing an appropriate category makes it more likely that your post will be noticed. Next, you will be taken to a page to choose a subcategory. Select the most appropriate option. This helps you more clearly define your ad so that it receives more attention. Enter a title, body, postal code, and any other required information for your sale item. The information outlined in green is required to post your ad. Information that is outlined in black is optional for the seller. After you enter the details for your ad, choose the Continue button. A page will appear with a map. This allows you to provide location information. Here, you can offer your location information for buying purposes. You can do this by dragging the location marker to your location or entering your location into the provided boxes. Make your selection. Next, you will be sent to the Add Images page. On the Add Images page, select the Add Image button. This will open the images stored on whatever device you are using. The picture is an important part of your Craigslist sale post. Try to take a clear image of what you are selling. Consider adding multiple images which display different angles to offer a potential buyer the best view possible of your item. Your image should not be larger than 600 pixels wide and 450 pixels in height. Check Chron for more recommendations on image requirements for Craigslist. When finished, choose Done with Images. You will see the final page in the Craigslist post process. Here, you will review your ad to see how it will appear to other Craigslist users. If you need to make changes, select edit post, edit location, or edit images respectively to make any modifications. Once you have made any final edits and like the appearance of your Craigslist sale post, choose the Publish button. A confirmation email will be sent to the email address you specified. When you receive the confirmation email, open and select the link to publish your Craigslist sale post (don’t delete this email). Congratulations! You have posted your item for sale. Once your item sells, don’t forget to cancel your Craigslist sale ad via the email link. One of the easiest ways to get your Craigslist ad noticed is to use a striking picture. You don’t need a high-end camera. These days, most smartphones come equipped with a camera good enough to capture a strong image. Here are some tips for taking a good photo. Make sure you have good lighting: Dark images make details difficult to see and are off-putting to potential buyers. Pay attention to what is in the background: Take time to set up a shot so that the background is not displeasing and doesn’t distract from your main focus: your sale. Take pictures from multiple angles: Move around your subject and take several pictures. Get a close-up shot and one from a distance. Take multiple shots that shows different angles of what you are selling and that provide perspectives of any details you want to highlight or any flaws in your sale. Show the size of your sale: Sometimes, it is difficult to see the scale of an item when there is nothing to compare it to. Think about adding something that illustrates the size of your object. For example, a pair of earrings could be one inch long or three inches long. A buyer looking for something flashy may not be interested in a smaller size. Include an item that doesn’t change in size for comparison, such as a dollar bill or a soda can. Never give out your address to any buyer. Meet buyers in a visible, public, well-lit place, such as a police station or grocery store parking lot. Take a friend with you or let someone know where you are going and when you plan to return. Remove geotags from your images before posting to Craigslist. Your safety is paramount. Trust your instincts. If you don’t feel safe, abandon the sale immediately. Good luck with your sale!